The story of a young heiress?s initiation into the dark society of the Chicagoland Vampires continues? Ten months after vampires revealed their existence to the mortals of Chicago, they?re enjoying a celebrity status usually reserved for the Hollywood elite. But should people learn about the Raves?mass feeding parties where vampires round up humans like cattle?the citizens will start sharpening their stakes. So now it?s up to the new vampire Merit to reconnect with her upper class family and act as liaison between humans and bloodsuckers, and keep the more unsavory aspects of the vampire lifestyle out of the media. But someone doesn?t want peace between them?someone with an ancient grudge? 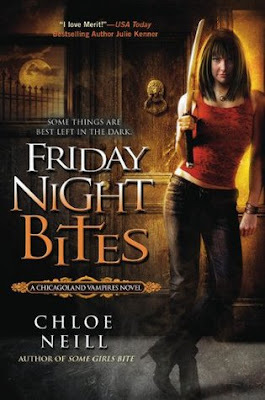 To be honest, I enjoyed Friday Night Bites a lot more than I did Some Girls Bite! Not only is the title carefully relevant to the very interesting plot, but the characters really grew on me in this one. My opinion of Merit was so-so after Some Girls Bite because I wasn't sure if she could be a good heroine; weird to say, I know, but I've dealt with the likes of Cat Crawfield, here! And I can certainly tell a good heroine from a lame one, I know my stuff. Enough said. It wasn't that she isn't well-written - Neill did her research - but Merit just seemed so confused in the last one, (and who could blame her with the vampire in her broken). Luckily she managed to redeem herself. Whereas in the previous book I felt almost an intruder, staring warily at the on-goings from a vantage point, here I knew the characters I was working with, and what to expect. It was a really great feeling to have. Chicago is the ultimate setting for this series, it just can't work anywhere else, and the Windy City really captured my heart. As did Ethan Sullivan. Again. Now before I ball out my eyes, I should return to the matter at hand, which is of course this review. It was an adventure, entertaining and especially near the end, unputdownable. I won't spoil it, but stuff goes down during the last couple hundred pages and everything else aside, you will be thrilled you stayed on the band-wagon until the end! I'm glad I did. While I'm still not a fan of Mallory (or Catcher for that matter). [I think my dislike for him literally spiked after he bit into Merit during that session! Not only was that totally unfair and out of line of him, (he is her coach/best-friend's boyfriend he had no right tearing her apart like that). The two of them are still really iffy in my opinion. Is Mal sweet? Yes, she's a great friend to Merit, but the deal with her being a sorceress still seems so scrambled and weird; I mean I need serious explanation, pronto. It is especially hard, I think, because this series is told through Merit's eyes and while she obviously does not live with the two anymore, it makes following Mallory and Catcher's Sorcery Adventures, near-impossible. Neill clearly wanted them to have pivotal roles in this series and that is where I think she flounders. Simply said, a book should not be so focussed on its secondary characters, the readers care more about the protagonist that, is why they buy the books that are about them. I do not give a hoot as to the going-ons of Mallory and Catcher's relationship woes or magic drama, I care about Cadogen House and the important drama, nothing more. So with that said, I can only add that I'm still reeling about how everything works together - how did Catcher and Mallory know each other from before, why are they suddenly not friends anymore, (Mal and Merit), and where does the important information go most of the time - I am still searching. There were a couple times I had to sit back and be like: "Ok, so how did we get here again?" *insert brow furrows and caveman-like thinking accompanied by Yankee Doodle background music* before finally, "Oh, that's how? It was a little confusing." *The real Yankee Doodle appears and nods in agreement, because he is naturally a fan of this series as well! We are in agreement. * Some things had this weird way of going 360 degrees in a circle until truths were gradually explained. I describe Ms. Neill's prose as unique, no book is perfect. She has her own style and I appreciate that. More importantly, I found myself really liking a lot of other things that ultimately out-shadowed those dark areas. They are so perfect together and I want them as a couple, ASAP! Thankfully Morgan is out of the picture soon enough and that ridiculous relationship bids sayonara - never trusted that one - and I get to reach my Merit-Ethan quota. The problems I feel are significant have been mentioned already and I find myself content - not completely satisfied, yet - but happy with what I got out of this read. It gets a solid 4 from me. But in other news, Yankee and I will journey through the next two books together and see more of our newly favorite coupled. Until then, we bid you adieu.